The #1 stainless steel spike product recommended by architects, contractors and government agencies. These spikes are installed on thousands of U.S. buildings with an incredible success rate, even under heavy bird pressure. It’s thin, stainless steel rods and U.V. resistant polycarbonate base are extremely durable and it is also the least conspicuous spike product on the market. Our professionals from TORO Pest Management offer bird spike installation services in all markets. Call us for an evaluation. 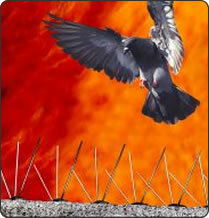 Humane: Unlike similar products, TORO’s bird spikes are blunted, preventing injury to birds or unsuspecting workers. No Debris: TORO’s bird spikes wires are spaced 1.5 inches on center-far enough apart to repel pigeons, yet avoid entrapping debris. Visibility: The clear plastic base and thin stainless steel rods are barely noticed from even short distances.